We received our March BarkBox yesterday and we couldn't wait to see what was inside. This will be our last BarkBox for awhile. Our puppy has a lot of toys and treats to last awhile, so we're taking a break, but it's not because we don't love this box! This month I expected to open the box and see a lot of green. I expected the box to have a St Patrick's day theme, but it did not. I was pleasantly surprised by the theme this month of Island Paradise. I'm in need of a vacation, with the long winter we've had, so I was loving this theme. Here is a peek at the box. 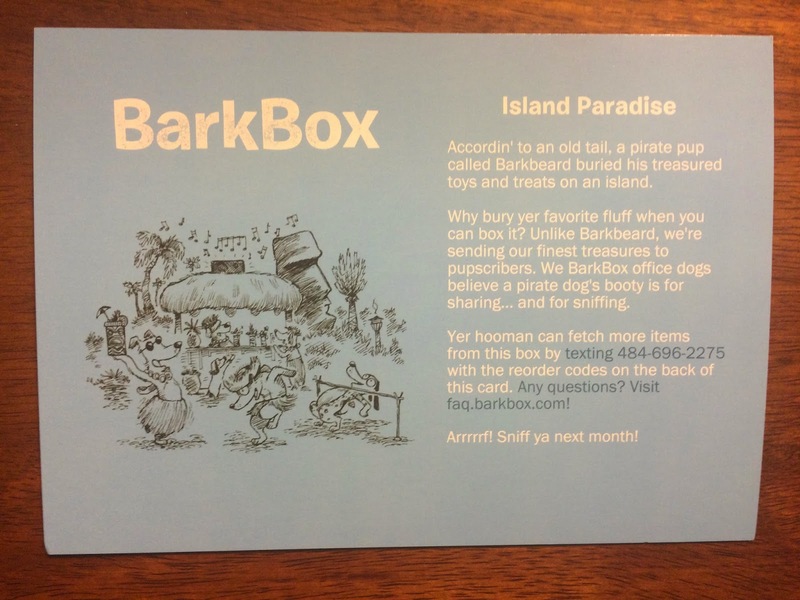 BarkBox always contains an information card explaining the theme for the month and everything included in the box. Plus reorder codes, in case you want to purchase any of the items in the box. The first item that caught my eye was the Swag Co. Parrot. Retail price $9. This is very cute and just the right size for our pup. 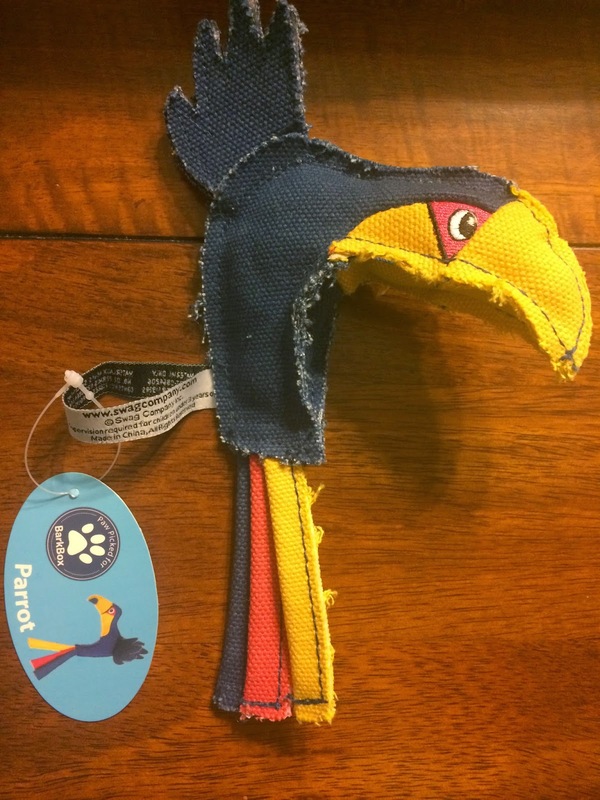 Our puppy loves all the BarkBox toys and this one is no exception! The next item included was Yeti Corp Golden Nugget. Retail price $8. These are different than anything I've ever seen. They are made from Nepali yak and cow milk, salt, and lime juice. The instructions say to puff them in the microwave and serve popcorn after cooling, or boil for 10-15 minutes in water then chop into bits as a food topper. 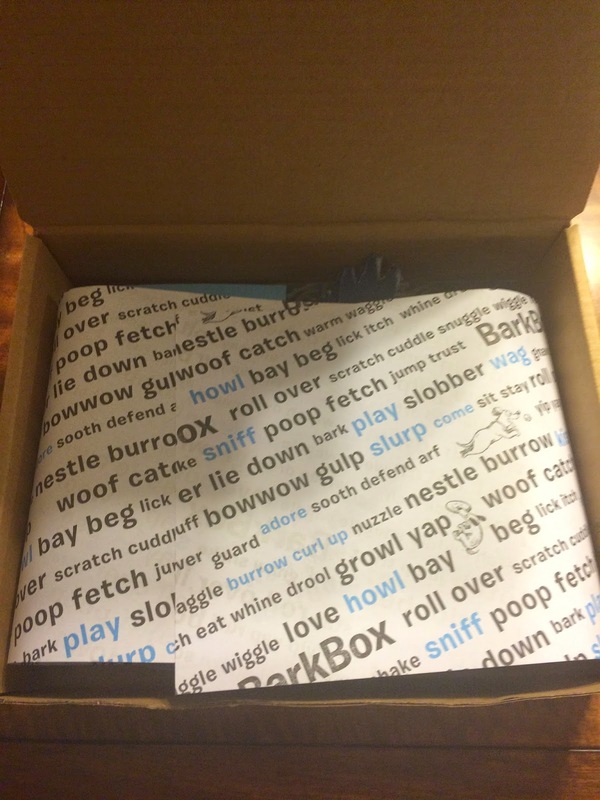 I love that BarkBox contains items I would never think of buying for our pup or can't find in my area. 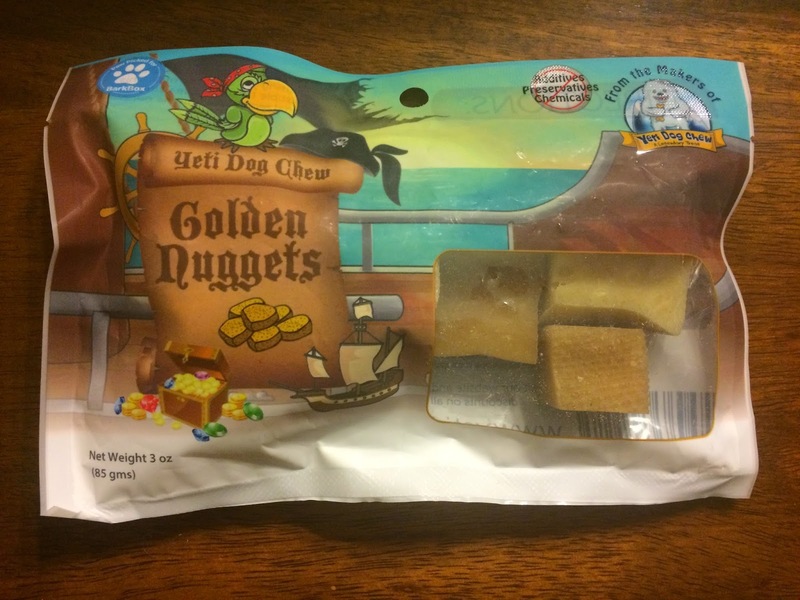 Our pup hasn't tried these yet, but they will definitely be different from anything he's had before. Hopefully he likes them! 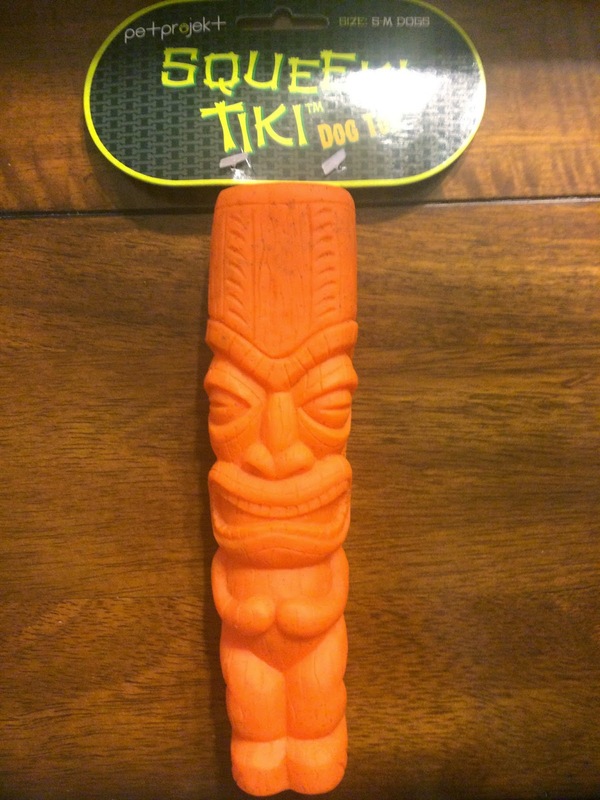 We also received PetProjekt Squeeki Tiki. Retail price $8. This is really squeaky and fun. I love the bright color too. This was a hit with our pup and our 2 year old! I'm happy with the variety of toys in this BarkBox. 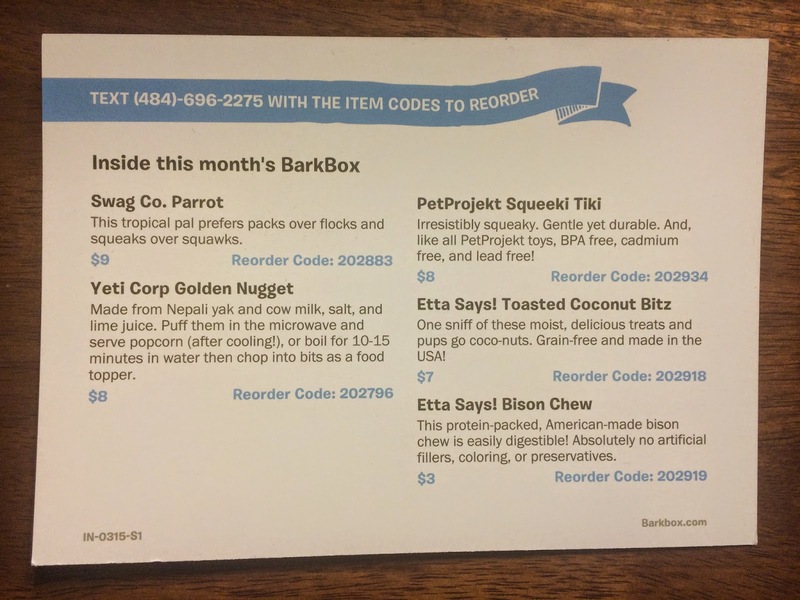 Another item included in the March BarkBox was Etta Says! Toasted Coconut Bitz. Retail price $7. 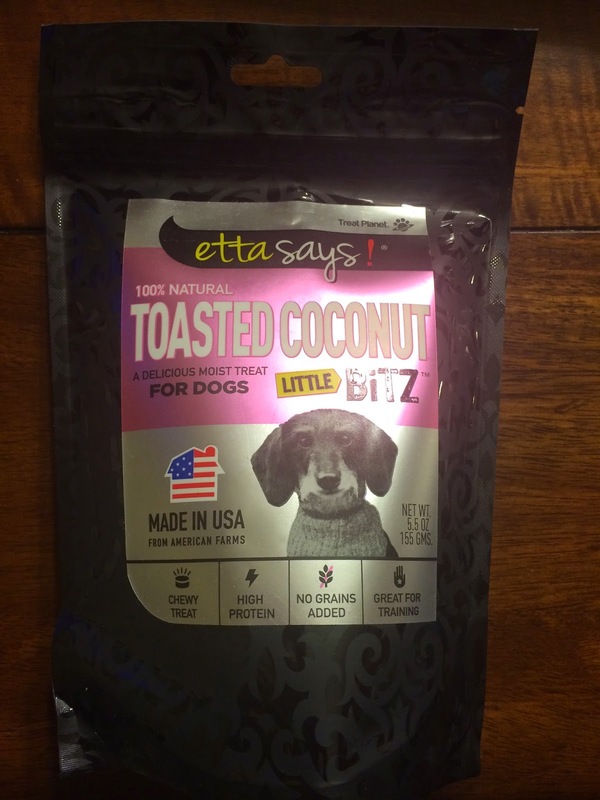 I love toasted coconut, so I'm hoping our pup will too, but he hasn't tried these yet. We have too many treats open right now, so we're waiting to open the new stuff. These do look yummy though, I'm tempted to try them myself, haha. The final item in the box was Etta Says! 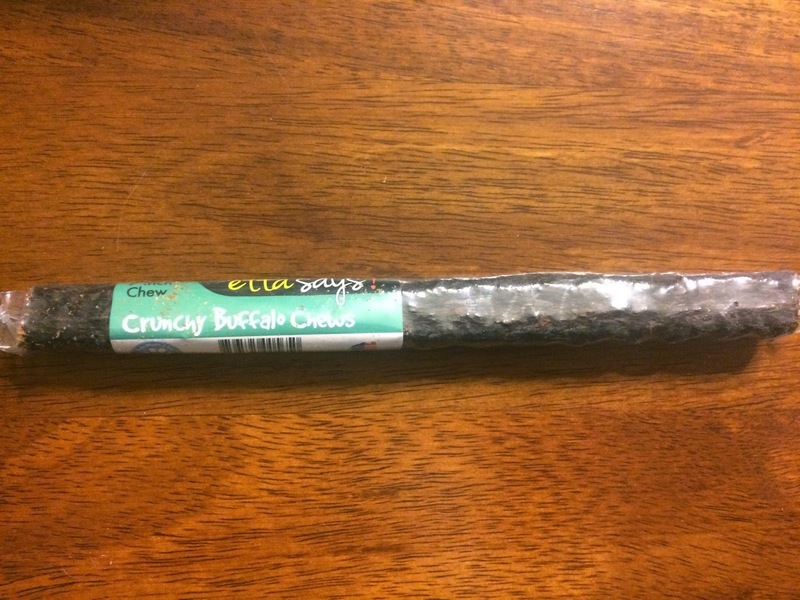 Bison Chew. I believe we received this same type of chew in duck, in one of our first boxes and I think our pup loved it and ate it right up! So, I'm sure he'll love this one too. I am very pleased with everything we received in our March BarkBox, as usual! The treats and toys are always different than anything I can buy around me. Once we get low on treats, we'll definitely be subscribing again. I'll be a little sad not seeing what is in the boxes each month. 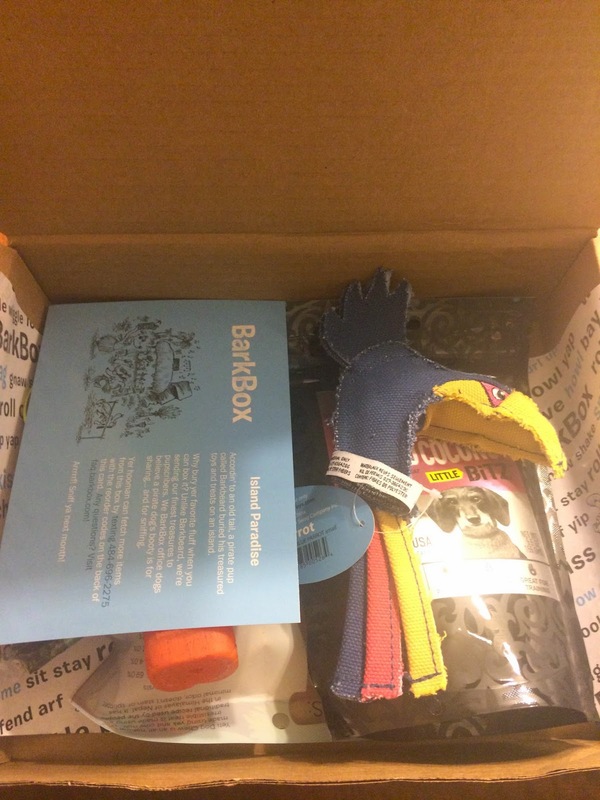 This is one of my favorite subscription boxes!